This taco soup is quick and easy to make. I got the recipe once from my sister in law and I am sure we have made it a hundred times. You can make it on the stove top by heating it through or make it in the crock pot and let the flavors simmer together all day. It’s a family favorite and the leftovers freeze very well. I often make a double batch in the winter months for those days when I get home late and need a quick meal. We often leave out the ground beef and add an extra can of black beans, to make it even more budget friendly without changing the overall taste very much. I have also blended the tomatoes on occasion because hubby doesn’t eat tomatoes he can see. Simply put all ingredients together and serve when heated through. Unless specified, do not drain the veggies. That’s it. Just heat through and serve. We add shredded cheese to the top as we are serving it, feel free to garnish as desired. Enjoy! 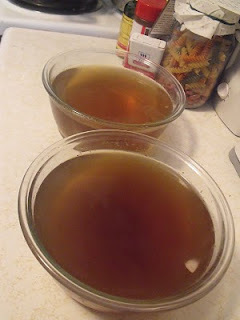 My friend, Katy, gave a great guest post yesterday on freezer cooking. Here’s a continuation of that post. I absolutely LOVE this kind of freezer cooking and I’ve been doing it for months. Chopped veggies: carrots, onions, celery, cauliflower. Cooked shredded chicken – We buy 20-30 pounds when it goes on sale for $0.79-$0.99/pound, and have a marathon cooking/de-boning/portioning session over the next 1-2 days, and then we have chicken for 2 months. Frozen pizzas. These are one of my husband’s favorites, so we usually have a couple in there. Everything is portioned out in smaller containers, usually 1-2 cups. I label these with masking tape and permanent marker on the lids with the item, the measurement, and the date. When I’m making my meal plan, I can look to see what I have, and plan accordingly. When I’m cooking, I just pull out the ingredients I need and dump them in. When you’re ready to begin your veggie chopping session, get out a large bowl for the peelings, stems, and whatnot. Wash all of your veggies. Carrot peels, celery stems, onion skins and tops, squash skins and ends, can all go into this bowl. The only thing I wouldn’t save is a part that is already going bad (hopefully you don’t have too many of those). If you’re not going to make the broth right away, put all of this in either a container with a lid or a big ziploc, and store it in the freezer. Otherwise, you can either make your broth on the stove or in a crockpot. Dump all your veggie bits in and add water until everything is covered, plus enough to fill your pot up to an inch from the top. Add seasonings of your liking. I usually add a large sprinkle of garlic powder, oregano, dill, salt, and pepper. Cover, and simmer on low for at least 2 hours. If you’re using a crockpot, put it on low in the morning, and strain out the broth after dinner. The longer, the better, as it gives the flavors more time to develop. Using a slotted spoon or a sieve, strain out your veggie bits, and you’re left with awesome broth. I usually portion this out in smaller containers of 1 to 3 cups, because that’s what most recipes call for. If I’m making a soup that uses more, I can always use 2 containers. These go into the freezer once they’re cooled as well. Leftover Mashed Potato Soup – potatoes don’t freeze well, but mashed potatoes freeze just fine!